I was a Yavneh camper for 9 years (1995-2003), which is the longest that anyone can be a camper without having a parent on the staff. As a camper, if you were to ask me my favorite things about camp, I would say that I most enjoyed Zimriyah and Havdalah. Almost 14 years later, when asked the same question, I have a similar answer with one addition: Yedidut. Yedidut is Yavneh’s new inclusion program for campers with special needs. The program supports the philosophy of K’lal Yisrael, which means that all Jews, regardless of background, are part of one family. The Yedidut program looks to accommodate the needs of campers who in the past may not have been able to attend Yavneh. In the spirit of equality and inclusion, Yedidut families pay the same camp enrollment fee as non-Yedidut families. The topic of special needs is near and dear to me because my older brother, Jeremy, had cerebral palsy and was mentally handicapped. In my life I have been in so many situations where I felt that my brother was, unfortunately, not included. I have also had many meaningful experiences when someone went the extra mile to accommodate him. That’s what Yedidut is doing: going the extra mile for inclusion. I love inclusion. I love it so much that I wrote a book about it (seriously!). In 2016, I published an autobiographical children’s book, entitled “I Can Understand.” The book depicts a relationship between a brother and sister, Joey and Ava, where Joey has special needs and Ava does not. Narrator Joey speaks for himself, explaining how even though he and Ava are different, they still have similar interests and a loving relationship. In order raise funds to publish my book, I launched a Kickstarter campaign. And that’s where my book has a tie to Yavneh: “I Can Understand” would not have been possible without my Kickstarter campaign, and three fellow Yavneh alums (one former counselor and two from my Kerem) donated to the project. Even after so many years away from camp, we are still K’lal Yisrael, just like Joel Sussman’s “Dor L’Dor” song says. I am so grateful to all of the generous donors who offered me an amazing way of sharing what I have learned from Jeremy. My brother is why I am here this month to discuss the topic of inclusion. 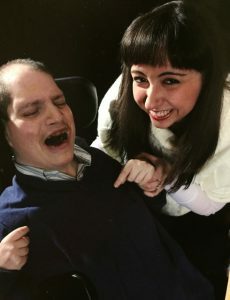 February 1st marks the start of Jewish Disability Awareness & Inclusion Month (JDAIM): a time when Jewish organizations are particularly encouraged to support inclusion efforts. Coincidentally, my brother was born on February 1st, 1972, and passed away on February 25th, 2013. I think of my brother every day, but February is when I think of him the most. This February, I encourage you take the time to think of people like him. Working inclusion into your life is incredibly simple. It’s about being aware of those around you who may need extra help, and offering them the help they need. 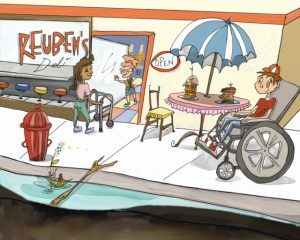 In my favorite illustration from “I Can Understand,” Joey and Ava are out for lunch, and Ava steps away from her meal to hold a door open for a person who walks with a walker. That’s really all it takes to be inclusive: pay attention, be thoughtful, and go a little out of your way. And if you’re an incoming Yavneh camper, inclusion is as simple as making a new friend from Yedidut.